The outcome of venue contract negotiation can make a difference to the success of your event, impacting everything from the bottom-line to attendee experience – not to mention your peace of mind. Here are ten areas you need to negotiate – and get results – with your event venue. Important Note: Always put out an RFP to multiple vendors to negotiate from a position of strength. You may have a favorite location when you start the RFP process but keep an open mind. Make it clear hat you’ll be going with the venue that you feel you can partner with the best. Remember – you want to get what you need (and maybe a little more), but a win-win will make for the best experience. Using Your Own Vendors: Hotels make a huge amount of money on things like A/V services and often have contracts that lock you in, with in-house providers. If you have an A/V partner you can trust – or any other type of outside vendor, for that matter – be sure to include a clause that allows you to work with them, without penalty. Learn more and get sample clauses for using your own A/V Services Provider here. Power, Rigging, and Labor: One venue fee often buried in the Terms & Conditions – and lost amongst the 50 other line items – is for power, rigging, and the labor costs associated. These can add up and have blindsided more than one event planner at the end of an event. Work with your event production partner to present an equipment list and floor plan in the venue letter to get an estimate from the venue – then negotiate these costs. Food & Beverage Rates, Minimums, and/or Cut-Off Dates: There are plenty of ways to arrange a menu to fit the budget and hotels are happy to work with you, so this is a natural area for negotiation. Be sure to keep your attendees’ experience in mind as you’re planning, so you don’t end up scrambling on-site to add last-minute items which will cost premiums. Cut-off dates are an important area for negotiation and venues will try to lock you in early; it’s reasonable to give them a number 30 days out with the flexibility to change it two weeks before the event and again five days before. Bonus Tip: When negotiating rates, cut-off dates, minimums, etc. use the question ‘How much flexibility do you have here?’ rather than ‘Is there flexibility here?’. The latter leaves the door open for a flat ‘no,’ where the subtle difference in question form indicates that you know and expect they have room to negotiate (and they do!). Free Space: F&B is typically the second largest profit center for hotels, so they often offer free space when you meet minimums. If it’s not offered, ask for it. Bonus Tip: Ask for Free Wifi too! Go for it in your meeting rooms, exhibitor floor space, and guest rooms; if you don’t get a ‘yes’ across the board get guest room access, at a minimum. Complimentary Room Ratio: Hotels will typically offer a 1:50 complimentary guest room ratio (1 free room for every 50 you book at conference rate). If you have more than 100 guest rooms, ask for 1:30. Hotels often concede this point at a 1:30 or 1:40 rate. Attrition: Standard attrition rates start at 10-15%; aim for 25-30%. Since guests often book lodging late in the game, go for a cut-off of 10-15 days pre-event and ask for a post-event audit for rooms booked through outside channels (hotels.com, Travelocity, etc.). Bonus Tip: Go for a reduction in attrition penalty on rooms sold directly by the hotel after your attrition date. Hotel Can Not Cancel Rooms: Turn-about is fair play. You cannot cancel on your hotel room commitment, so why should the hotel be able to cancel on you if they book a bigger group or have unexpected construction*? Include a clause that if the hotel cancels, it is obligated to find comparable alternate accommodations. Make sure to include language that has them pay the difference in cost for those accommodations (and include additional transportation needed). *You may consider a separate Renovation or Construction clause to allow for renegotiation or cancellation on your side if this occurs. Rebooking: If you know you’ll have future events, it’s possible you can get out of cancellation fees should they occur. Try adding a clause that allows you to apply any cancellation fees to new events booked within one year. The more business you can prove you have, the more leverage you have here. Total event spend: Sales managers know how much money they would like to receive in exchange for their services – in total. The “line item” approach taken by hotels and venues is to their benefit, not yours. Add up the total amount of money being spent on all services, and discuss reductions based on that number. It’s likely you’ll see more savings. 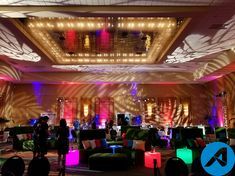 Venue Contracts: Don’t Get Locked Into Overpriced A/V Services	How to Use Audiovisual Technology to Make Your Event Branding POP!